When Mark Schuster was a medical student, he served on the admissions committee. He recalls interviewing a particularly well qualified candidate and rating him with perfect scores. After the interview, he was surprised to compare notes with a faculty member who had given the applicant very low marks. Curious what flaw he had missed, Schuster listened as the interviewer explained he just didn’t feel “comfortable” with the applicant. Stellar as he was, the student was also an effeminate man. Schuster recalls this incident and others that occurred on his way to becoming chief of general pediatrics at Children’s Hospital Boston. Since his training, medical schools have become more visible in their support for LGBT students and diversity. At the same time, decisions still get made in small committee meetings far from public view. Training in unconscious bias may help search committees and admissions deans become more aware of submerged prejudices that have overt consequences. A new NSF study finds that African-American recipients of Ph.Ds in science, engineering, and health fields are less likely than other minorities to work in research-intensive institutions. One possible explanation is that African-American scholars are more likely than other faculty to work at historically black colleges and universities, which are classified as master’s level institutions. Another contributing factor may be that African-American doctorates earned their degrees from universities outside the top tier of research intensity. The data show, however, that overall minority doctoral recipients are increasing, which could lead to changes in faculty composition in the future. Women receive over 50% of doctorates in the United States, but they make up only 38% of the instructional workforce. Women faculty are more likely to have lower rank, less job security, and lower pay than their male colleagues. Encourage the institution to develop a diversity mission and strategic plan. Educate hiring committees about the plan and offer them training in gender bias. Establish protocols for the hiring process. Promote cluster-based hiring to bring in a cohort of women faculty. Create a travel fund that allows faculty to take small children with them to academic conferences. These changes have more to do with prioritizing than providing additional resources. The pipeline problem can no longer be used as an excuse for the low representation of women faculty. By developing an overall plan and implementing concrete steps, a university can close the gender gap. Even at elite colleges, underrepresented minority students obtain lower GPAs than majority students. Two Stanford researchers hypothesized that a reason for this performance gap could be the minority students’ lack of confidence. So they conducted a randomized controlled trial in which some first-year students read essays by upperclassmen of all races about how they too had trouble fitting into college at first. The nontreatment group read essays that had nothing to do with belonging. After this short intervention, the investigators tracked the students until the end of college. They found that African-American students in the treatment group had higher GPAs and greater levels of happiness. The readings had no effect on white students. They published their results in Science. If a brief confidence boosting halved the achievement gap, then imagine what more concerted efforts to address students’ self stereotyping could accomplish. The study also points to the social origins of academic performance. When it comes to diversifying the faculty, one of the common arguments is that departments must choose between excellence and underrepresented minorities. As a powerful column by a university provost makes the case that this a false choice. Yes, there are a limited number of open faculty positions and so offering a job to one person requires shutting out another. But diversity should not be a consideration solely at the point of hiring. Concern for attracting a broad applicant pool needs to begin before the job description is even posted. It needs to come into play when considering where to advertise, how to train search committees on unconscious bias, and how to interview candidates. Then, once the most representative pool of candidates is assembled, departments should hire the best person for the position. Achieving diversity is not desirable for its own sake. Rather, it advances the educational mission of any university. The University of Texas Medical Branch at Galveston enrolls a much larger percentage of underrepresented minority students (25% compared to 15% nationally). Despite the success at recruiting a diverse student body, the medical school was not as accomplished in helping those students achieve. Only 2.9% of non-URM students failed the USMLE step 1 exam, but 16.6% of URM students failed. In a study published in Medical Education, professors at Galveston report how they were able to boost those numbers so that 1.9% of non-URM students failed the exam and only 3.9% of URM students. They implemented a wide-ranging rethinking of the curriculum, replacing a traditional memorization model with integrated learning. They incorporated problem-based learning and greater interaction with faculty. At the same time, the school invested in faculty development resources to equip teachers with skills in assessment and pedagogy. The transformation did not happen overnight. The findings emerged from a comparison of students who matriculated between 1995-1997 and those who started between 2003-2005. But their experience shows how an institutional effort to improve learner outcomes can make a difference. Openly gay men and women now lead institutions of higher education as diverse as Hampshire College, Roosevelt University, and the University of Maine at Farmington. There are now enough LGBT college presidents (about two dozen), that the leaders held their own summit this year. Michael Roggow has been interviewing gay and lesbian university presidents over the last two years and has come up with tips for both LGBT candidates for top positions and for search committees looking to signal inclusiveness. Let the search committee or search consultant know your sexual orientation, but focus on your accomplishments. Find out as much as possible about the institution to determine if it’s a good fit. Develop a network of supportive friends. Value a candidate’s accomplishments, not just personal characteristics. These suggestions apply equally well to recruiting at the faculty level. The National Academy of Science, National Academy of Engineering, and Institute of Medicine issued a report calling for an increase of minority students in science and engineering. Underrepresented minorities comprise just 9% of the college-educated workforce in STEM fields (science, technology, engineering, and mathematics). It would take a tripling of those numbers to reflect their portion of minorities in the general population. The scarcity of minorities in these fields will not come as a surprise to anyone in academic medicine. The specific recommendations of the report, however, are novel. It identifies undergraduate retention as a key area. 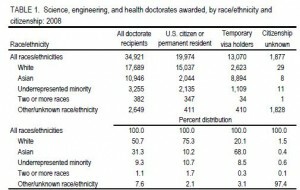 Minorities pursue science degrees in equal numbers to their peers, but fewer complete their degrees. Some reasons for attrition are financial, but the drop out rates can also result from inadequate support networks. Freeman Hrabowski, contributor to the report and President of the University of Maryland, Baltimore County, describes how his campus made inroads in encouraging minority students. They conducted focus groups to understand how different groups felt about the problem or if they even acknowledged it. They also engaged students with a more collaborative curriculum and opportunities to conduct research with faculty members. The physical separation of the medical campus makes mentoring of undergraduates more difficult, but it is one way that we can prepare the pipeline for a more diverse faculty. Among its libraries, office buildings, and dining halls, Harvard hangs 750 oil portraits of illustrious university citizens. Of those, 690 depict white men and only 2 are of minorities. According to a Boston Globe report, Harvard is now devoting funds to adding images of women and minorities. The move signals to current students and faculty that diversity is not a fad but an essential part of the institution’s history. It’s an imposing line-up that effectively conveys the longevity of the school. But it also paints a limited picture of the inclusive history of our campus. If there are images of the first Native American MD or the first African-American woman physician, they are not prominent. Celebrating our past visually makes everyone here today feel welcome. Linda Pololi, a former professor of medicine and now senior scientist at Brandeis’s Women’s Studies Research Center, conducted interviews with women and minority faculty to find out why academic medicine has not been hospitable to them. She summarized her findings in a recent article from the Chronicle for Higher Education. Her subjects described a system at odds with the altruistic values that motivated them to pursue academic medicine. They found the work environments competitive, individualistic, and profit-driven. Moreover, women and minority faculty members suffered from unconscious bias. Faced with such a structural problem, Pololi discourages separate diversity initiatives. Rather, she calls for a change in culture that values all members’ contributions.